Last week I cooked more than 2 kilos of Ube Halaya which so much for our family of four. So how are we supposed to consume this? Well, ube champorado is the key. Champorado is a Filipino chocolate porridge. It is a staple breakfast or merienda meal. However, I am not a big fan of this dish as I want my breakfast to be savory. However, I watched a Kapuso Mo Jessica Soho Episode featuring ube champorado and I thought of trying this dish since I made so much ube halaya last week. The process of making this dish is the same with the regular champorado. However, ube halaya is the star ingredients instead of the chocolate or tablea of the regular champorado. You need to use lots of ube halaya to infuse its flavor into this dish. When I mean a lot it means 3 cups of ube halaya is to 1 cup of glutinous rice. But trust me, you need this much to have that creamy ube flavor and that deep purple color. Champorado is best paired with tuyo, right? The sweet flavor of the champorado really compliments the salty savory taste of tuyo. Ube plus tuyo does not sound or even taste good, well that is based on my imagination. So, I simply grated some regular cheese on top of it and it taste wonderful. 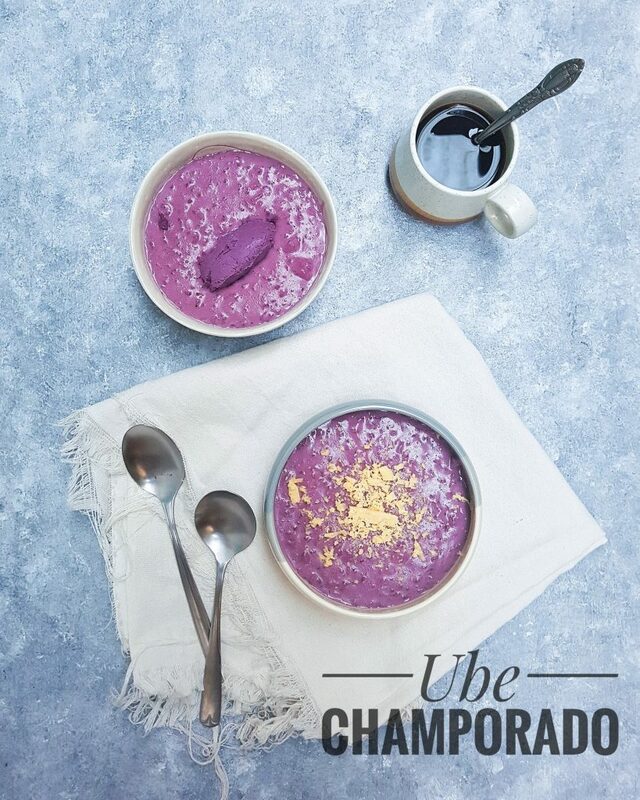 The creamy salty taste of cheese really compliments the sweet taste of ube champorado. I decided to use the regular cheese instead of the quickmelt or fancy cheese since I still want that chewy texture while having that creamy taste. You can add a dollop of ube for that extra ube flavor. Cook together rice and water until rice is soft. Start stirring when the rice is starts to cook. Add Ube Halaya slowly with continuous stirring. Add coconut sugar and salt. 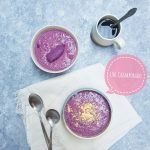 This champorado recipe uses ube halaya instead of the usual chocolate.